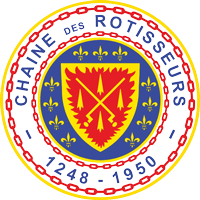 In 1977, a coterie of dedicated gourmets established the Albany chapter of La Confrérie de la Chaîne des Rôtisseurs as the 50th such group in the United States. Dr. Joel Spiro, who was instrumental in forming the group, served as the Bailli (President) of the Albany organization for an incredible 19 years. This chapter is credited with being one of the key factors in elevating the culinary arts in the Capital Region from the “surf and turf” fare which pervaded the 1970’s to the current world class fine dining standards we now enjoy. In 1996, the chapter was extremely fortunate to discover a new and dedicated leader, the Hon. Frank A. Tate, Jr. Judge Tate continued the traditions as originally established and worked tirelessly to present imaginative and exciting dinners. After 11 years of service as Bailli, Judge Tate stepped down and in 2007, was replaced by William M. Harris, the current Bailli, and only the third person to hold that position in the chapter’s illustrious 38 year history. Bailli Harris raised the bar even higher and his succession of memorable and one of a kind dinner events are legendary for their flair, creativity and attention to detail. Our chapter has thrived throughout the years and our membership has grown to 100, making it one of the largest Bailliages in the Northeast region. The Albany Bailliage typically hosts five black tie dinners a year at high-end restaurants, hotels or catering facilities in the area. These dinners are “events” eagerly anticipated by the members and often centered around an imaginative theme concocted by the chef, our Bailli and sometimes the general manager. Membership in the Chaîne is by invitation only, and in order to attend one of our dinners, non-members must come as the guest of a current member. The Albany Chaîne is one of about 135 such chapters in the United States. La Confrérie de la Chaîne des Rôtisseurs has some 22,000 members worldwide in over 70 countries and almost 6,000 members here in the United States. The Chaîne is unique in that both professionals (chefs, restaurant owners, caterers, wine merchants and producers) and non-professionals can join. In the Albany chapter almost 40% of our members come from the professional ranks. The Albany Chaîne dinners allow both the professionals and the amateur gastronomes to partake in the pleasures and camaraderie of the table by enjoying meals that are imaginatively created, artistically presented, professionally served and accompanied by wines (often from our cellar) that are meticulously selected to enhance each course. If you have any questions concerning the Albany Bailliage, please contact William M. Harris at (518) 432-5981 or by email. Gold medal and chain on green ribbon. Gold medal and chain on blue ribbon. Silver medal and chain on orange ribbon edged in red with Rôtisseur insignia. Silver medal and chain on purple ribbon edged in light blue.